No, really, she is so sweet and I just adore her from her head down to her little paws. I mean, really, who couldn't love that sweet face?? Even, Isky, my mom's bratty little yorky loves her! I made this pillow not too long ago to commemorate all of our dogs that we have right now. 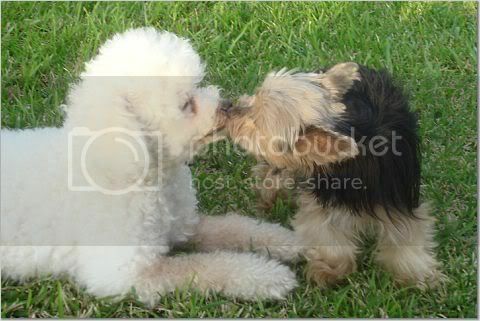 The poodle obviously is for Angel, and the two yorkies below her are for Isky and Kooty, the coolest dude I've ever known! 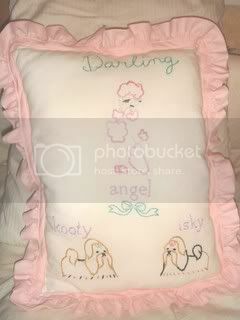 This pillow was actually one of my very first things to embroider. Of course, I used my beloved Sublime Stitching patterns for it. 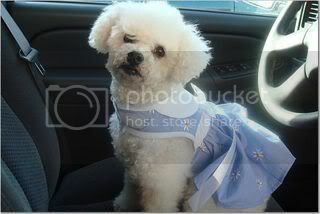 It was also one of the very first things I ever used a sewing machine for.. I did kind of a hackjob on it, too. Be thankful the picture isn't very upclose and personal!